The winning team stands holding the $5,000 grand prize. Image: TechCrunch. 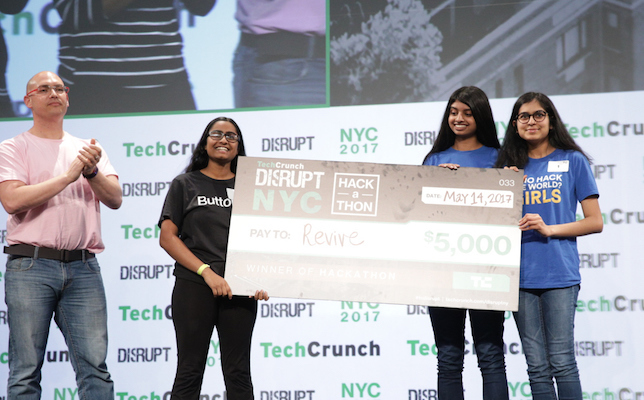 At TechCrunch’s Disrupt NY 2017 Hackathon over the weekend (May 13-14), three high school female students from New Jersey won first place for designing a virtual reality (VR) tool that can help diagnose attention deficit hyperactivity disorder (ADHD). The hackathon preceded the Disrupt NY 2017 conference this week (May 15-17) and brought about 750 engineers, developers, designers and other individuals together to build tech projects, TechCrunch reported. A total of 89 teams each presented a one-minute demo for a chance to win the $5,000 grand prize. The winning team built a VR app for the HTC Vive called reVIVE that uses three tests to “gauge the user’s motor skills, sustained concentration and reaction time,” TechCrunch wrote. All scores are recorded in the app and sent to their APIs through Firebase as well as IBM Watson, enabling the data to be collected and analyzed over time. Two of the three students worked with #BuiltByGirls, an organization that garnered national attention after AOL and former First lady Michelle Obama launched the #BUILTBYGIRLS Challenge. The reVIVE app is not meant to replace a therapist’s role in treatment, but rather serve as a telemedicine tool that can speed up the often costly and lengthy process. According to a Devpost post, the team will explore additional use cases for the app, like anxiety and other disorders. Read more on the hackathon’s other prize winners here.